When a society turns into a minefield, one can never tell which misstep will cause an explosion. A democracy that reduces citizens to mere voters, placed in front of the TV to watch the government’s antics, creates an underlying landscape of rebellion. Erdogan’s government did not keep track of this. They thought that they had developed Turkey; but the people saw their rights disappearing. The Government thought this rebellion insignificant, just a few youngsters who resisted the demolishing of a park. But the police’s brutality unleashed a movement. The world started to witness yet another youth rebellion. After Cairo, Tunis, Wall street London, Paris, Madrid, Tel Aviv, Manila, Delhi, Dhaka, Stockholm, this global public agitation came to Istanbul, and breathed upon the neck of their government. Weakened fabric rips at the slightest tug. When citizens are distanced from the state, a slight tug can wreak havoc. These events are a warning from the Turkish people to their government. But the rebellion has not yet attempted to oust their leaders. Thus, Taksim Square cannot be compared to Tahrir square. Rather, the movement shares greater similarities with Occupy Wall Street. It is too early to call this the Turkish Spring. Istanbul’s city government started destroying Gezi Park to build a shopping mall. State power almost always looks down on the people’s strength. So, the government viewed this youth agitation against commercialization of a public space, as a small law and order issue. 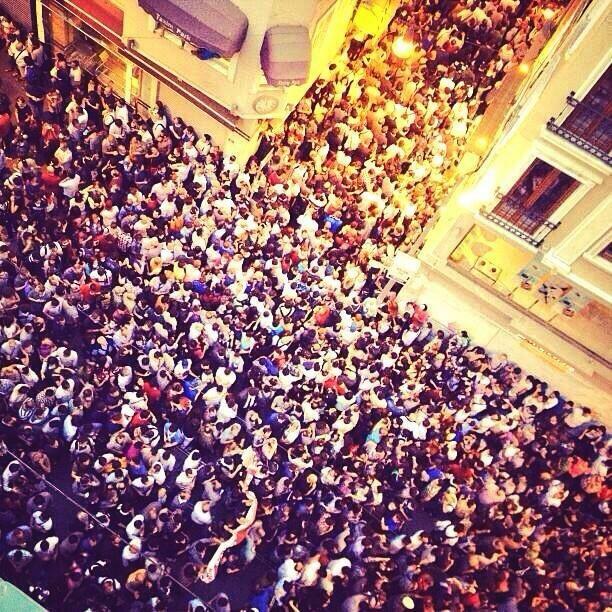 From 28th May to date, thousands of young people have been protesting against the Turkish government. They are breaking laws to continue their aggregation-protests. They have attacked the office of the PM, and crated blockades throughout the country. 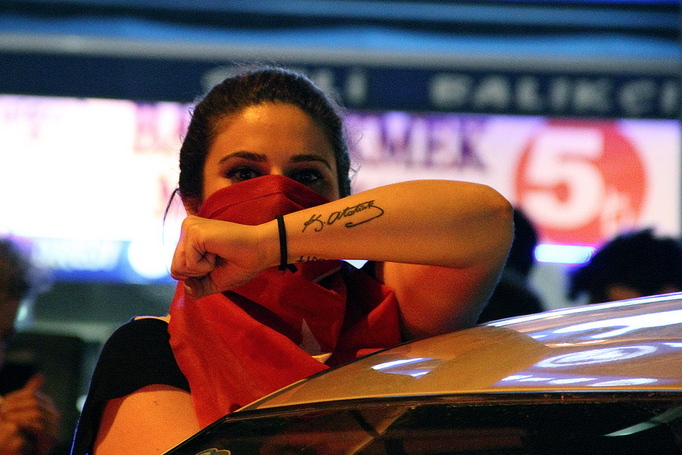 The Turkish protests are allowing the world to witness the country’s deep maladies. The oppression underlying a country applauded as a centrist Islamic Republic with a neoliberal economic model has now been revealed. Turkey’s Islamic government was practicing a combined politics of Islamic nationalism and destructive capitalism. The combined pressure had started to destroy solidarity, and perceptions of cultural tolerance. It affected how young people went about their lives, and how men and women interacted with each other. 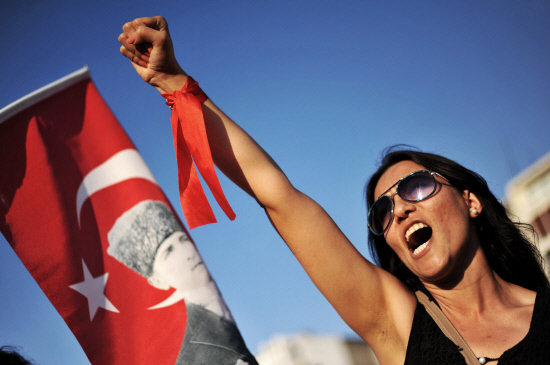 The Turkish protests are part the global insurgence shaking up the existing system. It once again proves that a few courageous people speaking the language of the majority can create a fire from a spark. So, at first glance it appears that the disagreement is about the existence of a park. But this is a rebellion of Turkish society against the state. Until the 6th of June, two people have had died, non-government sources put the number at six. Thousands have been hurt. But Turkey’s allies, Europe and the US government, have been as quiet as they have been vocal about Syria or Iran. The irony is that the majority of Turkish youth has not respected this Islamicization of law and culture, and has not supported the Erdogan government’s self-benefitting development practices. Erdogan has been elected by a massive number of votes. Despite being a three-time PM, he has not established democracy. US-ally Erdogan has used the same language to course out his own citizens that the US president uses against foreign rebellions. In his eyes, the protestors are looters and terrorists. It is ironic, that the young people make the same allegations against the government. Understanding the situations’ complexity, President Abdullah Gul was the first to come to his senses. He apologized for the brutality of the Home Ministry and the Police. He also acknowledged the movement’s justification, and its democratic underpinnings. Turkey’s centrist Islamic party is a close friend of US and Israel in the region. The AKP government has worked closely with the US on Iraq, Iran, and Syria. AKP leader Erdogan has focused both on internal and international matters – he was ready to play games on both sides. On the one hand, peace accords with Kurd rebels, paving the way for NATO intervention in Syria, and on the other, transforming the government from Parliamentary to a Presidential system were the two primary items on his agenda. His attraction to a Presidential system comes from his desire to stay in power. His term ends in 2015. Turkey’s constitution does not permit any leader from pursuing four terms in office as PM. Therefore, his plan involved electing himself President after transitioning to a Presidential system. Turkey’s secular opposition and small Islamic parties were against Erdogan’s struggle for power. They have also supported this youth rebellion. But Syria should be the happiest. Turkey was a weapon for the US, France and Britain in sending aid to Syrian rebels. Erdogan is a supporter of Turkey’s new conservative capitalists. His primary opposition did not stem from Syria’s Assad or Lebanon’s Hezbollah, but rather, the Turkish people. During the Egyptian rebellion, he had said to Hosni Mubarak, “Mubarak should listen to the people.” He also said something similar to Assad. Now, Turkey’s own people are screaming “Government, are you listening?” It is time for Erdogan to listen to his people. Rebellions in different countries have one thing in common. They don’t have any representation from existing political forces or organized classes. From Tahrir to Turkey, Dhaka to Wall Street – a new class has started to emerge. Who are these people? They are the Precariat. They are the ordinary young citizens, like you and me. In each instance, they form the majority. Where hopelessness, economic insecurities, and inhumane politics have plagued society, these are the people who have learnt to quickly organize, with the help of their new found education, and social media. They have been angered by job insecurities, uncertain futures, and social divisions. And from Tahrir to Taksim, they are the key actor in today’s rebellions. Some social scientists have called them a dangerous class. But the bigger problem occurs when the Precariat and Proletariat stand side by side. 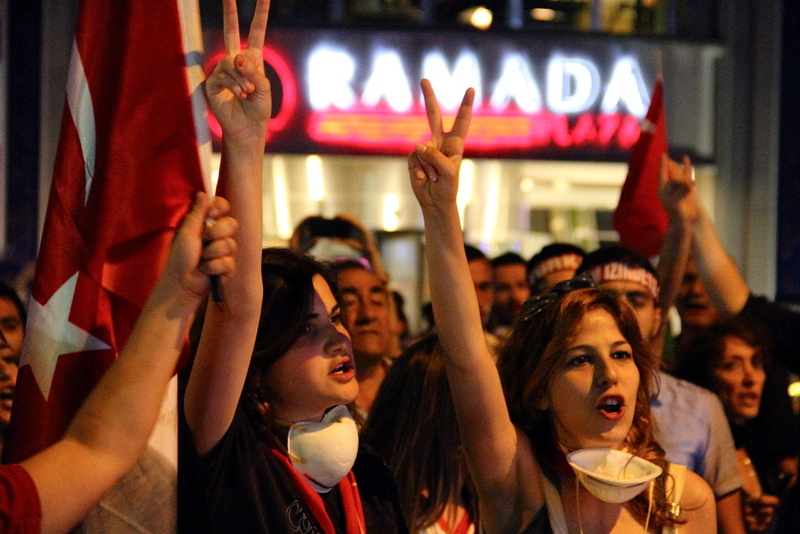 The working class has now started to get involved in Turkey’s rebellion. Twenty two contemporary left-leaning trade unions have legitimized the protests by joining with their 24 lakh members. So, if Erdogan wants to stay in power he has to step back. Although US-Europe-Asia’s youth movements have the youth element in common, one difference is striking. With the exception of Occupy Wall Street, the western movements have consisted of minority Muslim immigrants, and Arab-Turkish movements have drawn majority Muslims. Secular Mubaraks and Islamic Erdogans have become the minority. In country after country, this movement of the majority may usher in a new era, where democracy will truly belong to the people. But only the future can tell what outcomes the Precariat’s historical role will bring. This article is so wide of the mark that I don’t even know where to begin. All it demonstrates is that the far left projects its own views everything and is willing to cooperate with the far right against its common enemy. The usual platitudes about rebellion against “neo-liberalism” and “capitalism” only shows how the far left is willing to deceive itself. In reality the majority of the protestors are right wing Kemalist (augmented by even further right elements like Grey Wolves supporters) nationalists who are upset that the state is no longer a dictatorship that caters exclusively to them. They are reflexively ant-Erdogen, anti-Kurd and pro-Assad (As seems to be Mr. Wasif himself ; He conceives an elaborate conspiracy theory about peace with Kurds allowing NATO to intervene in favour of the Syrian rebels. His concern for the brutal Assad dictatorship, sorry “Syria” is touching, but Mr. Wasif should perhaps keep in mind that the peace process is in Turkey’s own interests and has nothing to do with Syria except in his own fevered imagination) Where is the far left in all this? Well, having no following of their own and unable to make this all about “capitalism” as Mr Wasif claimed, they merely jumped into the bandwagon of the Kemlaist movement providing their own veneer of legitimacy. They can’t actually make protests against “neo-liberalism” but they can ally with the far-right against the common threat of “Islam” under spurious “secularist” grounds. If Mr. Wasif knew anything about Turkey and did not simply perceive everything through the lenses of leftist dogma, he would know that the AKP has advanced democracy and freedom (And the economy, although Mr. Wasif may see it all as “neo-liberalism”) further than any previous “secularist” government in Turkey’s history. All this despite being hobbled by the mechanism’s of dictatorship bequeathed to it y the original Kemalist regime. Thankfully they have managed to defang the military and for the first time in Turkey’s history advance a genuine peace process with the disaffected Kurds. All despite fierce opposition from the Kemalist elite, the present architect of the protests (Some were even calling for a military coup in the beginning of the protests; thankfully the military is in no position to do so). Which brings me to the “secular” opposition so extolled by Mr. Wasif. Does he even now the first thing about them? Let me help him out. The main opposition is the right wing Kemalist CHP, heirs to the legacy Mustafa Kemal (An actual brutal tyrant compared to Erdogen. He was quite literally a fascist who admired Mussolini among other things but never mind he was “secular”). They are virulently anti-Kurdish, pro-Assad, pro-military, anti-minority and their “secularism” consists of refusing to allow hijabi women from attending university. The other main opposition party is the even more nationalist, anti-minority right-wing MHP. Leftists of his tribe are nowhere to be found in parliament but even so, Mr Wasif should think twice before extollling such right-wing, anti-democratic elements for their supposed “secularism”. Finally on to my final point about Erdogen’s need to heed the will of the “people”. Unfortunately reality is not as Mr. Wasif would like it to be. Reliable polls still show the AKP as the most popular in the country and having the confidence of the vast majority of the citizens, with recent pro-AKP demonstrations being even larger than the protests. Funnily, I don’t recall hearing nearly as strong words for Hasina after the much more violent police/chatro league crackdown on hefazot protestors (We are still waiting for the full death toll of that one). More ink was spilled criticizing the protests then the government, yet Mr. Wasif neatly pivots himself when the protests are happening in a foreign country, manufacturing grievances (“neo-liberalism” and “capitalism”) out of thin air. An excellent response by Tec15 to an essentially shallow and uninformed post about Turkey. 1. The demonstrators do not represent the forces of progression but the forces of reaction. They represent the traditional urban secular elite that ruled the country and believed in an enforced secularism and westernization which carried with it an inherent hatred for religion. These people believed – and believe – that it is their mission to make the whole of Anatolia follow the social culture of the “enlightened west”. This traditional elite thus despise the conservative Anatolian majority for clinging on to indigenous Anatolian Muslim Turkish culture. Some Kemalists (i.e. these demonstrators) have even suggested in the past that elite “educated” Turks vote be given two points in elections and the “uneducated” Anatolian peasantry be given one vote. This elite is also very anti-Kurdish and the policing of these riots has been nothing compared to the far more repressive policing of the Kurds in the past. These elites do not want a pluralist Turkey which recognizes the reality and diversity of the country i.e. conservative Anatolian Turkish majority (mainly AKP), Kurdish minority etc but want to continue the almost century long (and failed) Kemalist project of enforced secularization and Turkification. 2. These demonstrators do not believe in freedom, but in restricting freedom. – No freedom for women who want to wear the headscarf. – No freedom for Kurds who want to express their identity. In the past they urged a military coup. Now that the essentially fascist military has been defanged they have resorted to street violence and riots. These riots may have cost the Turkish economy $5 billion. They will not succeed in the anti-democratic attempt to overthrow a legally elected government by a powerful minority. Jamal, what are your criteria for identifying forces of progression vs. forces of reaction? How do you classify what is democratic and what is anti-democratic? I am just curious. 1. Though the protestors may be socially liberal and wear western style clothes for many (probably the majority) of them their political ideals are not liberal. Traditional Kemalism was based on French Republicanism which called for militant secularism and a mono-ethnic state. This has damaged both Turkey’s conservative majority who treasure Islam as their religion and part of their identity, and the belief in a mono-ethnic state has severely affected the Kurds who have had 3,000 villages destroyed, 2 million people made refugees in the 80s and 90s and 40,000 people killed. Traditional Kemalism i.e. a return to it is what most of these demonstrators want. This is a regression to a failed anachronistic model. Traditional Kemalism also borrowed and in turn influenced other radical nationalist i.e. fascist ideologies and states of the 1920s e.g. Italian fascism and German Nazism (both Hitler and Mussolini liked Ataturk). What Turkey needs is a more inclusive, moderate social democratic state which respects peoples right to practise their religion and for Kurds and other ethnic groups to express their cultural identity. 2. These demonstrators are not democratic in they do not believe in the will of the majority of the Turkish nation. The Turkish masses are far more respectful of Islam than the secularized urban elites who believe that they are the guardians of the eternal Kemalist revolution. However, to balance all this out. People should have the right to question their government and protest against them (many of these demonstrators went further and engaged in violence and destruction). Is there anything like Global Youth Rebellion? Has any one defined it? Are there any linkages or international net work? Is there any ‘new” ideological or political underlying thoughts behind? Or are these including Shahbag Jagoron have been inspired purely by local / national conditions? very critical. Popular frustration is so acute that a social-political time bomb, out of the blue, can suddenly destroy what ever little democracy and uneasy peace Bangladesh has.